When Typhoon Ondoy hit the Philippines, we at the Tapulanga Foundation immediately tried to figure out how we could best help our brothers and sisters in Manila. 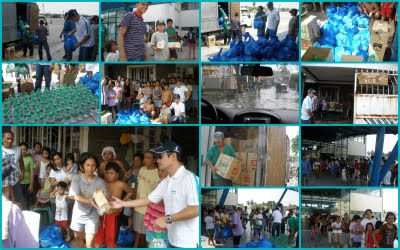 There were so many people affected from the calamity and we could not ignore their cry for help. While various government and corporate relief agencies were available to assist the victims, we felt the best way to help out was to work with a smaller group - no red tape, no politicking, with people we can actually trust and who can get the help to them fast. With the power of social networking sites such as facebook, we found the right person who could do the job. Leny Ojano-Yusay lives very close to the flooded areas and started her mission by helping out small groups. Eventually they were able to assist bigger communities as more people were needing help and more people were sending donations in cash and in kind. With the success of their recent fundraisers in California and Maryland, the Tapulanga Foundation was able to come up with $3300. In addition, we got additional donations from individuals such as Wally Booth, Alan Montelibano and an anonymous donor. We plan to continue helping out the victims by sharing our proceeds from a Rafe New York sale on November 14 in Manila and a Photo exhibit on December 8 in Bacolod (stay tuned for more info on both events). 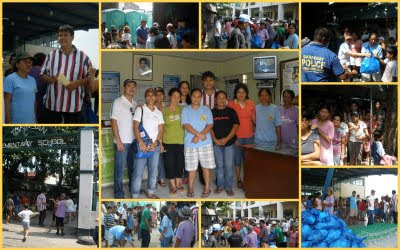 We went to 4 evacuation centers last Sunday Oct 25, 2009 in Brgy Tunasan, Muntinlupa. The evacuation centers were shelters to the residents of the nearby areas near Laguna Lake. As shown in the photos, even some areas of Tunasan are still submerged with floodwater. We have 7 tanods, 10 barangay health workers and 2 DSWD workers helping us there with their head barangay health center coordinator, Francis Tagle. Gerard (my husband), my son, Miguel and I went there with our drivers and truckers. 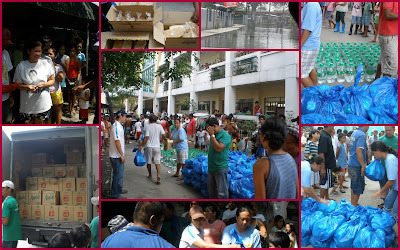 We have served a total of 380 families for a family of 5pax good for 2-3 days worth of goods. This can at least help sustain them as they don't have livelihood since some of them are farmers or fishermen (their fingerlings have been washed away by the flood).